Capillary problems manifest themselves mainly as a series of symptoms resulting from poor circulation in the legs. This complex of symptoms is classified under the term veinous insufficiency. Among these are obviously the varicose veins themselves, which may or may not be visibly deformed. In addition to these deformations of structure, most people complain about functional problems such as pain, swelling, itching, restlessness, and cramps that, in many cases, also can cause insomnia. All these functional problems are favorably influenced by OPCs. Although OPCs cannot make seriously deformed varicose veins disappear, they can decrease the extent to which they occur, often as the result of accompanying swelling. In the case of surgical removal of varicose veins, OPCs are a very useful means to support recovery. In 1980, 78 patients with serious venous problems in the legs were tested with 3 x 50 mg of OPC per day. The researchers described the results as favorable. In 1981, the effectiveness of OPCs with regard to functional venous problems in legs was tested in patients who didn’t have deformed veins but who suffered nevertheless from the functional symptoms. The patients were tested with a placebo and subsequently with another medicine (Diosmine). In both cases, it appeared that a recommended daily dosage of 150 mg OPCs diminished the functional problems that can arise during impaired venous backflow: heavy legs, cramps, and swelling. The researchers point out the importance of recognizing these functional problems and treating them even before the varicose veins are visible. In 1981, OPCs were once again tested on 50 patients with functional disorders (chronic venous insufficiency). Also in this test, OPCs were compared with Diosmine. All functional symptoms appeared to have improved after 30 days following the intake of a recommended daily dosage of 150 mg OPCs. Both remedies appeared to be effective, but the researchers noted a significant advantage with OPCs in terms of speed and the duration of its effectiveness. Venous insufficiency was again tested (in 1985) on 92 patients who took 300 mg of OPCs per day. This test also concerned functional disorders such as heavy legs, itching, nighttime cramps, and (subjective) edema. After four weeks, the treatment turned out to be successful for 75 percent of the patients. OPCs’ circulatory benefits in eyes, kidneys, gums, legs, liver …. 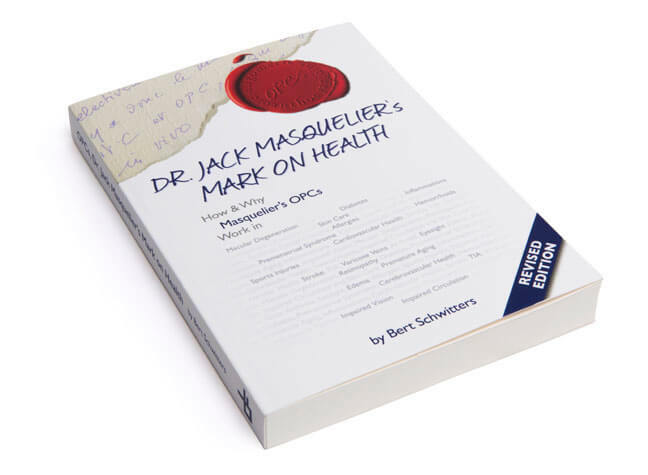 OPCs, Dr. Masquelier’s Mark on Health briskly tells you how and why Dr. Jack Masquelier’s discoveries and inventions are of essential importance to human health.